As an entrepreneur, you have a unique opportunity to build, maintain and acquire credit both personally and as a business owner? Just like you have a personal credit score, your business has a credit score. You need to know what it is and to manage it, according to Rumia Ambrose-Burbank, President, VMS365 and Founder, Sole de Frio. The BE 100s CEO (No. 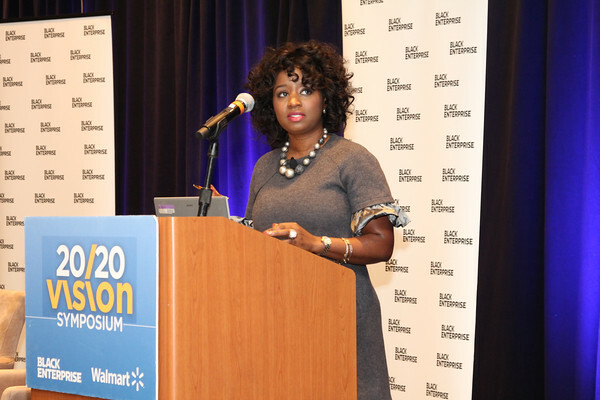 60 on the Industrial/Service list with $53.7 million in revenues) spoke on “building banking relationshipâ€ at the 20/20 Vision Forum On Supplier Diversity hosted by Black Enterprise and Walmart in Atlanta. While banks primarily use business credit or commercial risk scores, they also matter to manufacturers, wholesalers andÂ business service firms. Credit scores aid business relationships, noted Ambrose-Burbank, while addressing a room full of entrepreneurs interested in learning how to do business with major corporations such as Walmart. To decide whether or not to do business with a firm and on what terms,Â potential corporate partners will take into consideration a business credit score. Keep in mind that business credit reports and business credit scores are completely separate from your personal credit report and personal credit scores. A business credit report shows the same types of information as a personal credit report, but it is specific to a business’s debt repayment and public records, such as bankruptcies or tax liens. Business credit scores also might include information about the business owners and officers. Whereas the FICO score has the largest presence in consumer credit scoring world, commercial information firm Dun & Bradstreet is often used for business credit reporting and scoring. D&B gathers information on the credit worthiness and financial stability on over 140 million businesses. Using Dun & Bradstreet reports, companies can review information on public records such as bankruptcy filings and liens, payment histories, and recommendations on credit worthiness. Related Story: Do You Know Your Business Credit Score? What does your company look like to your banker and the rest of the world? Ambrose-Burbank asked referring to the D&B Rating, Pay Index (trade references), and Visibility Score. In addition D&B, credit bureaus Equifax and Experian provide business credit scoring. Just like you should check your personal credit score every year, you should regularly monitor your business credit score. Challenge any discrepancies or negative information, Ambrose-Burbank advised. Vendors are required to respond to a claim for a payment dispute, which often times they don’t, giving your record a clean slate.